Picture book about generosity and giving to those less fortunate published by Scholastic Inc. The quiltmaker lives high in the mountains and spends each day stitching beautiful quilts. Gorgeous richly coloured fabrics are carefully pieced and stitched into traditional designs. When the weather is cold, the woman visits a nearby town and searches for poor, homeless people. She wraps the beautiful quilts around those who are cold, sharing her love and compassion with those who are most needy. Not far away lives an unhappy, greedy king. He is never satisfied with the gifts he receives. Despite all of his riches, he always wants more. When the king hears about the quiltmaker and her beautiful quilts, he decides that he must have one of her marvelous creations. 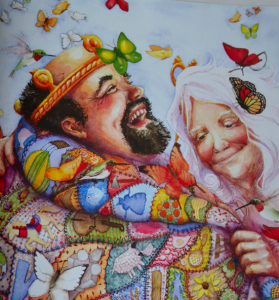 He is convinced that one of her quilts may be a key to happiness. The quiltmaker is unwilling to give the king a quilt. She knows that he is very wealthy. She instructs him to give away all of his possessions and tells him that, once this is done, she will have a beautiful quilt for him. He is angered by her response and decides to punish her. He sends her away and later regrets the punishment only to discover that the quiltmaker’s compassion has kept her safe. Beautiful, detailed watercolor illustrations highlight this thoughtful picture book about generosity and giving. Best-suited to children aged five years and up, The Quiltmaker’s Gift offers tremendous opportunities for quilting-related extension activities and discussions about social responsibility.